It is almost like the German version of pizza. I didn’t add the bacon but there is quite enough lard, eggs and double cream to be getting on with thank you very much. The taste of marjoram is nice in the pastry. 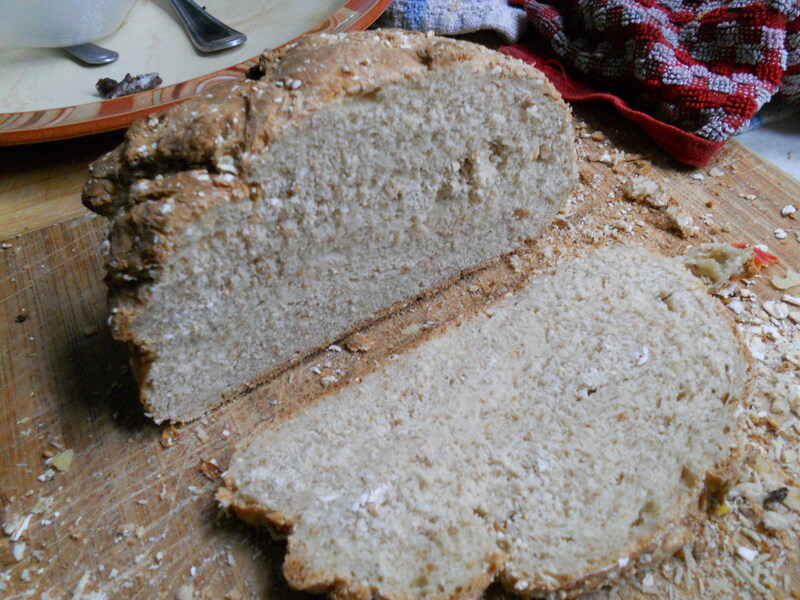 I have been feeling a bit low the last couple of days and sometimes when I feel like that baking bread cheers me up and so I decided that I would try an easy rye loaf recipe from Elizabeth David. 1 It is like only a 1/6th rye, the rest is strong white flour. Should that even count as rye bread? 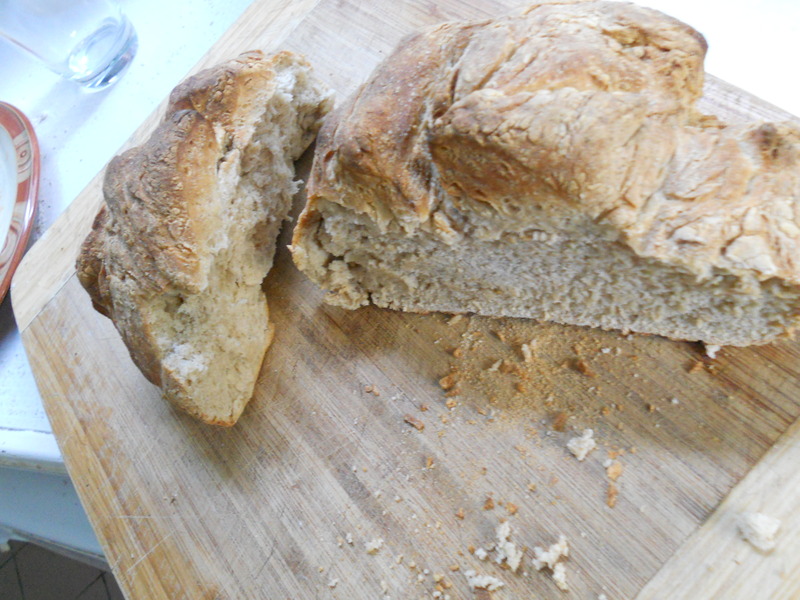 3 After I baked it the loaf had the hardest crust in the world, somewhere between cement and brittle granite. Although the recipe did say to put it in a tin, and because I am without tin I just put it on a baking tray. 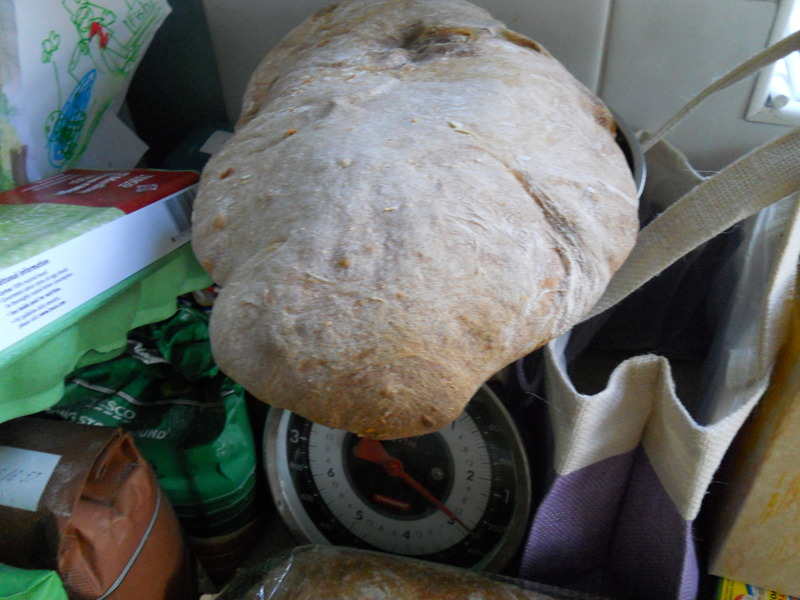 Maybe in a bread tin the crust might have been softer? 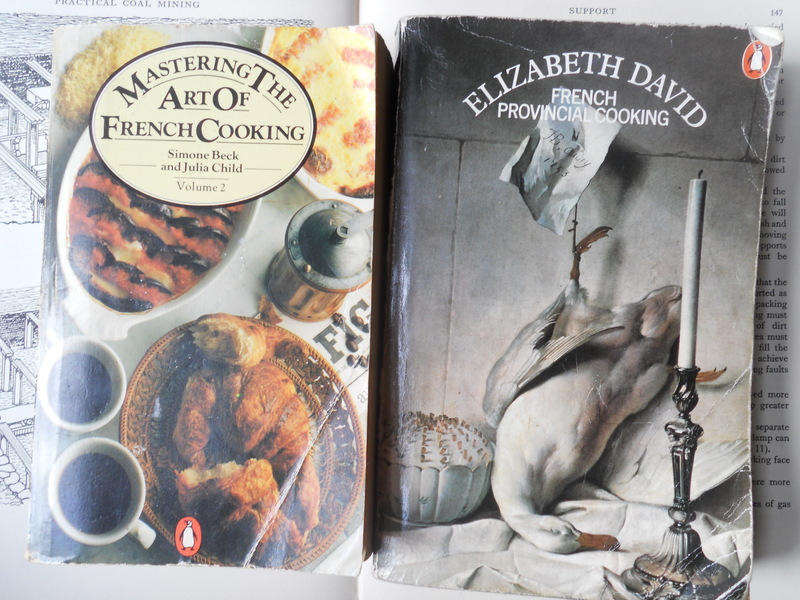 4 Elizabeth David just doesn’t agree with me as a cookery writer. I’m not sure why that is. Is it because she seems like a bit of a snob or lacking in humour? 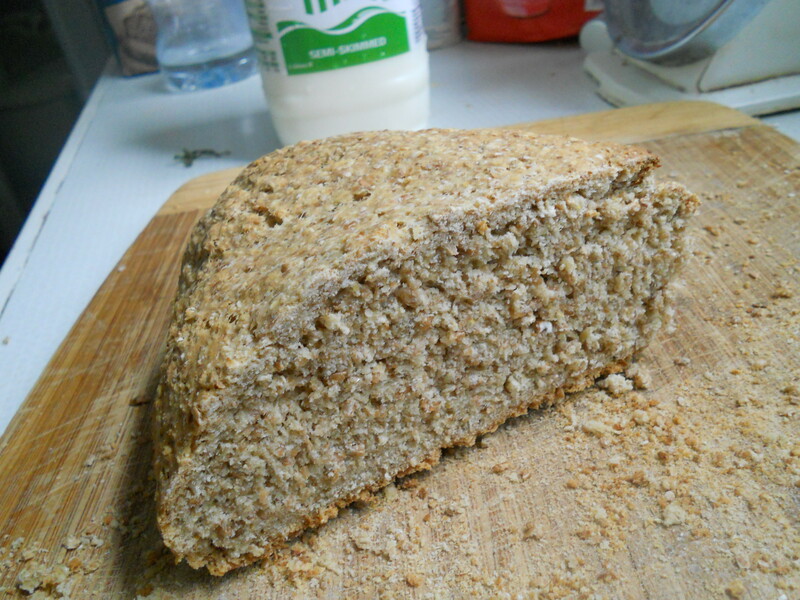 So what we learned from all this was that we won’t be making the easy rye loaf again.The crust was hard (I like my teeth) and it didn’t taste that tasty. This has been my experience of muesli. Mix a sachet of quick action yeast with one teaspoon of honey and 150ml of warm, body temperature-ish water and leave for 10 mins. Or leave for a few hours as I did after forgetting and going out of the house. Work in 125g of muesli and knead for a few more minutes, seperate dough and shape into rounds on baking tray. Leave for 1hr. Bake in an oven for 30mins or so at 230 c.
Well that’s what I did and I got a nice little brown loaf. It was maybe not as light as it should have been but I just had a slice a few days later toasted and it tastes grand to me. Plus the bag of muesli in the corner has been tamed. There is also a recipe in this book for Weetabix and it just so happens that there is a packet of unloved Weetabix in the cupboard as well so I must give that a go next time. We had a little party on Wednesday for Mrs Canalways which involved some cooking and preparation of food, of making tortillas and baking bread, whirling up some pesto and dips, cleaning and washing up afterwards. This might sound like hard work or a lot of effort (why not just go to M&S and buy a few bits and bobs?…which we did do) but I enjoyed doing it. And it seems like a good thing to do. If there is one truth that I’ve learned about Christianity over the last decade or so, and if there is one setting where it seems to make sense it is around a few olives or a beer or two. Around a table there is a bit of give and take, you can enter long and lazy conversations, you can get to know your neighbour and it seems like an equal relationship. I was reading this in Mediterranean Cookery by Claudia Roden. ‘Mediterranean society is family-based and that is where real Mediterranean cooking at its best is to be found. The home cooking of a society with strong family ties, large clans and women at home has none of the rigid rules of haute cuisine. And when dishes are passed down in the family they are fill of the little touches which make them both exquisite and individual. That seems to me like pretty good advice for a church to take on board as well.